Charter-boat captains on Lake Erie rely almost exclusively on weight-forward spinners to locate walleye schools in the vast expanses of open water. 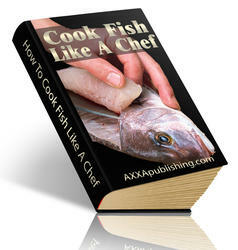 The lures excel whenever fish are scattered over a large area or suspended at a certain depth. Most weight-forward spinners also work well for fishing in deep water or fast current. They have narrow bodies which cause them to sink rapidly and hold their depth. Others are better suited to sha1-lower water because their wider bodies give them aplaning effect. Some models have a long wire shaft in front of the head to reduce the chances of a bite-off when fishing northern pike or muskies. The lead body on a weight-forward spinner makes it easy to cast. The body is molded to the shaft and acts as a keel, preventing line twist. Because of the position of the weight, the lure sinks head-first. The blade spins while the lure is dropping, attracting fish and tempting them to strike. Weight-forward spinners are usually tipped with some type of live bait, so most come with a single hook. The hook is attached to ride with the point up, making the lure relatively snagless. 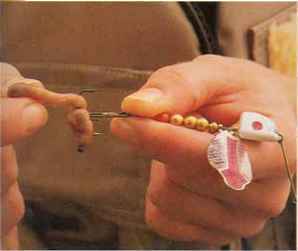 Fishermen who use nightcrawlers often replace the single hook with a treble. The worm stays on the hook better and yon will lose fewer fish. 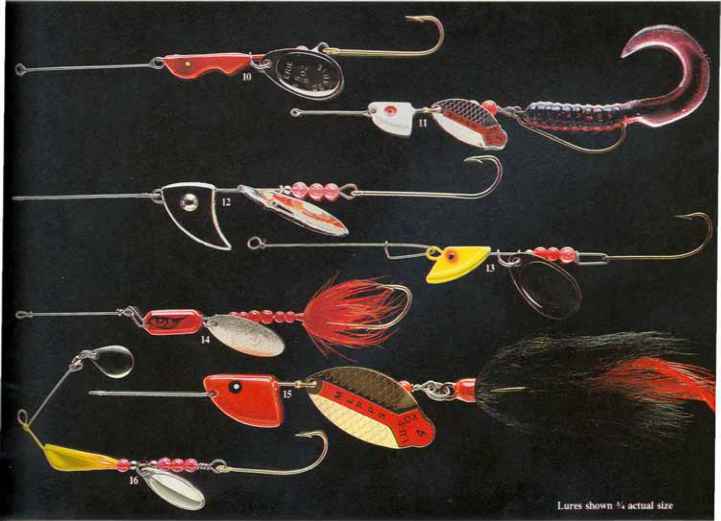 WEIGHT-FORWARD SPINNERS have a lead body a single or treble hook with or without dressing. Most have molded to the shaft, a spinner blade behind the body and a tapered head which slips through weeds. The fast-sinking design makes the weight-forward spinner a natural choice for bottom-hugging fish like walleyes. 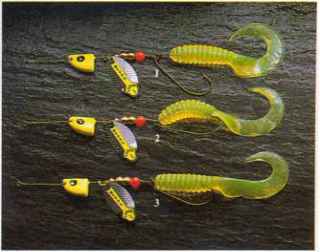 But these lures will also catch smallmouth and spotted bass, northern pike and trout. Because you can cast them a long distance, weight-forward spinners work well for reaching surface schools of white bass and stripers. 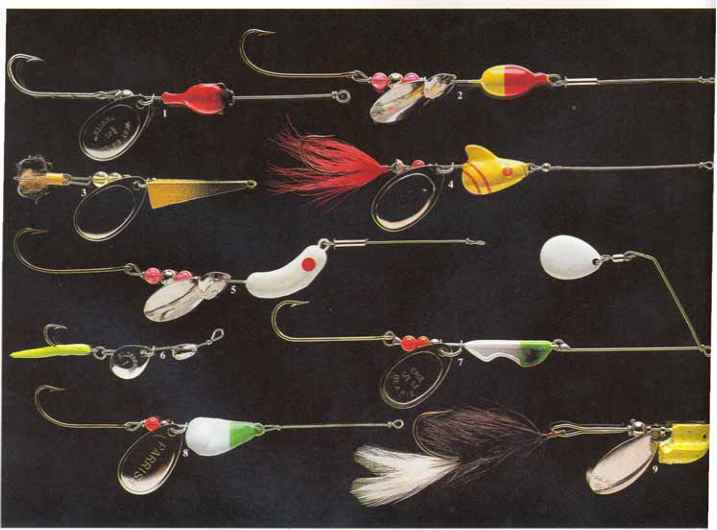 For small- to medium-sized trout, smallmouth and spotted bass, and white bass, use weight-forward spinners from 1/8 to 3/8 ounce; for walleyes and large trout, 1/4 to 1/2 ounce; and for striped bass and northern pike, 1/2 to 1 ounce. If cast improperly, weight-forward spinners tang1e easily. The lure sails through the air headfirst, so the hook tends to catch on the line. To avoid this problem, use a soft lob cast rather than a snap cast. Stop the lure just before it hits the water. This will turn it around and prevent the hook from catching the line as the lure sinks. 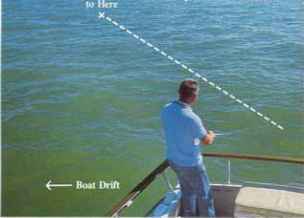 ANGLE your cast downwind as the boat drifts, then count the spinner down to the proper depth. Start your retrieve with your rod on the upwind side"holding your tip low and at an ang1e to the line. relatively constant depth when retrieved, so they remain in the fish zone longer than most other lmes. When you begin your retrieve, lift the rod tip sharply to start the blade turning. Begin reeling when you feel the resistance of the blade. Reel fast enough to keep the blade tmning. Weight-forward spinners work well when reeled steadily, but a darting retrieve Tay produce more fish. Periodically make a long sideways sweep with yom rod, then bring your rod forward while reeling rapidly to keep the blade tmning. Fish often strike just as the lure begins to accelerate. Tie a weight-forward spinner directly to your line. Because the lure will not twist your line, you do not need a swivel. A snap or swivel increases the chances of fouling, because the lure can whip around on the cast. 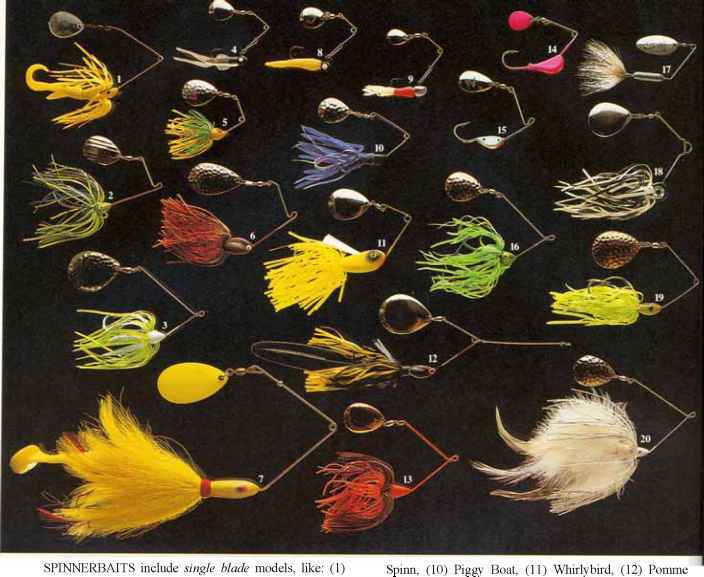 Walleye and trout fishermen often tip weightforward spinners with nightcrawlers. Pike anglers generally use minnows. Pork rind and soft plastic tails also work well for tipping. 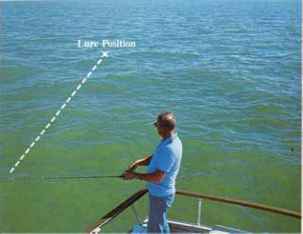 SWnCH your rod to the downwind side as the lure swings to the upwind side. Keep your rod tip low and at an ang1e to the line. Holding your rod at an angle in creases your sensitivity, so you can detect subtle strikes. GOB a nightcrawler on a weight-forward spinner so that no more than an inch of the wonn trails behind the hook. Crawlers increase the buoyancy of the lure, enabling you to fish slowly just above bottom without snagging. RIG a soft plastic tail on a keeper hook by (1) inserting the barbed shaft into the tail. (2) Bend the tail before inserting the hook point, then (3) push the hook into the tail until it nearly comes out the opposite side. How to fish weight forward spinner? How to use a keeper hook? 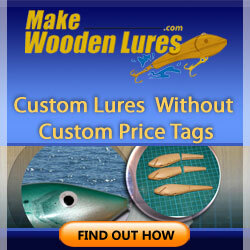 How to make weight forward fishing lures? How to rig 2 spinners to the 1 line? Where do i find lead bodies for spinners? How fish with weight forward spinners on lake erie? How do u fish an erie dearie forward spinner with live bait? How to make walleye spinners? How to use weight forward lures for walleye on lake erie? Do it walleye spinner mold? How to make a weight forward spinner?